The Adder SmartView Multiscreen SVMS2-QUAD KVM switch expands the horizons of computer control by adding multiple monitor support to an advanced KVM switch. The SVMS2-QUAD enables a keyboard, mouse and 4 monitors to control 2 computers. 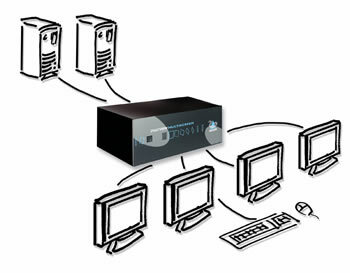 The Multiscreen is a new concept in KVM switches and enables you to benefit from all the convenience of the proven SmartView switches which taking advantage of the multiple monitor facilities available on many modern computers. Computers fitted with multiple video cards are becoming more common as operating systems have developed to make use of the extended video "real estate" offered by multiple monitors. The increased display area enables more information to be presented to the user without reducing the resolution. The Multiscreen SVMS2-QUAD enables several computers equipped with these multiple video facilities to be controlled from a keyboard, mouse and an array of monitors. All the monitors and the keyboard and mouse are switched together from one computer to the next giving you full control of the wider picture. The Adder SVMS2-QUAD maximizes the video quality by minimizing any ghosting, smudging or fading effects. DDC (Display Data Channel) signaling is supported on all the SmartView's video ports making them "plug-and-play" compatible and enabling your computers' video cards to be configured for best performance. Question: Hi... does this KVM supports inalambric keyboard and mouse??? Answer: Thank you for your inquiry. We have confirmation from the manufacturer that this particular switch takes advantage of some PS/2 emulation. Since wireless connections communicate vastly different than wired connections, combined with the fact this unit uses emulation techniques, we do not believe it will support wireless PS/2 devices.